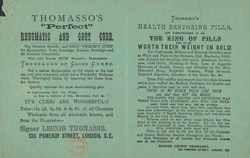 Medicines such as Thomasso's 'Perfect Cure' and 'Health Restoring Pills' claimed to treat a host of illnesses, from coughs and asthma to rheumatism and gout. Home remedies and over-the-counter pills were less expensive than a visit from the doctor. However many of the medicines advertised in such a manner had no medicinal ingredients. Arsenic, tar, creosote and soap were all included in the concoctions at one time or another. This began to change when Holloway's 'Health Restoring Pills' were prosecuted for false product description, having been found to contain nothing more than butter, lard, turnips and wax.